BMW has done a pretty good job in keeping some of the design elements and oily bits of the new 8-Series family a secret so far. Nevertheless, a set of images, shared by Wilcoblok on Instagram reveal the interior design of the posh Convertible. And, for the first time, there isn’t any camouflage to keep parts of the dashboard away from our eyes. As a result, say hello to a new digital instrument cluster, which was already previewed by the automaker a month ago. 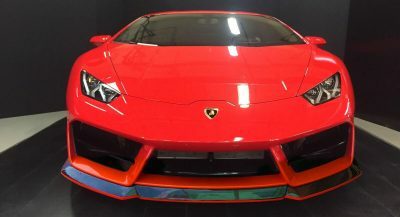 It brings new graphics, a central area that shows the navigation, and probably other functions, too, tachometer, speedometer, coolant and fuel gauges, all wrapped in a larger display. It will also be adopted by the facelifted 7-Series and upcoming X7, as well. BMW isn’t quite ready to ditch the physical buttons yet, so the new BMW 8-Series models have plenty of these scattered around the dashboard and central console. Notice the new infotainment system that sits on top of the central air vents, which appears to be a bit larger than the one used inside the 7-Series. Elsewhere, this car is adorned with lots of red leather and metallic accents. 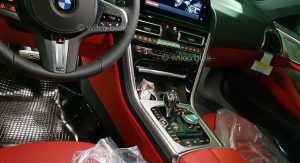 It also has a three-spoke multi-function steering wheel, with paddle shifters fitted behind it, and the ‘M’ badge suggests that this is, perhaps, not the M8, but the M850i, as the social media webpage states. 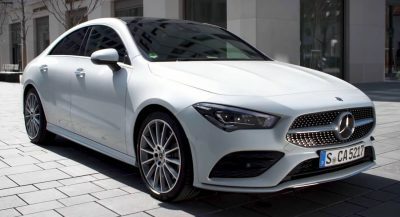 If this is the case, then expect a new V8 engine with 530PS (523hp / 390kW) and 750Nm (553lb-ft) of torque, channeled to the xDrive all-wheel drive through an improved eight-speed automatic transmission. These specs have been shared by BMW themselves, and a recent report claims that the Coupe should be able to cover the 0-100km/h (0-62mph) sprint in less than 4 seconds. So, expect about the same from the Convertible. 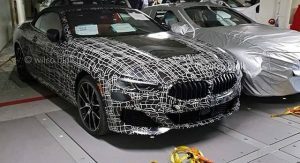 The new BMW 8-Series family will officially be presented on June 15, and it’s expected to go on sale later this year. It’s unknown at the time whether the range-topping M8 will be unveiled on the same date. you call that huge? You should see mine! That is NOT what she said…..after seeing my huge ————–>Steering Wheel. Doesn’t look special or chic. S-Class convertible is much better. This looks uninspired. 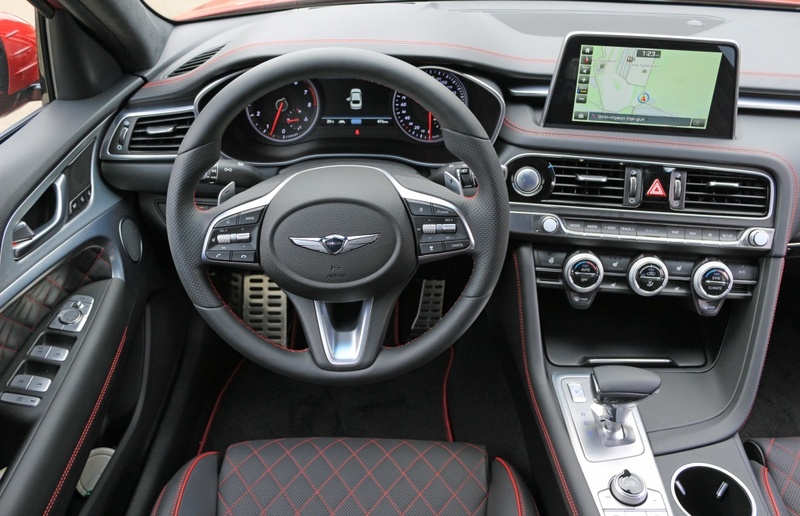 Dunno why but i love this black-red interior. 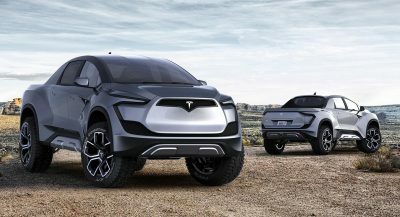 Probably becasue it’s new car which i’m looking forward to. 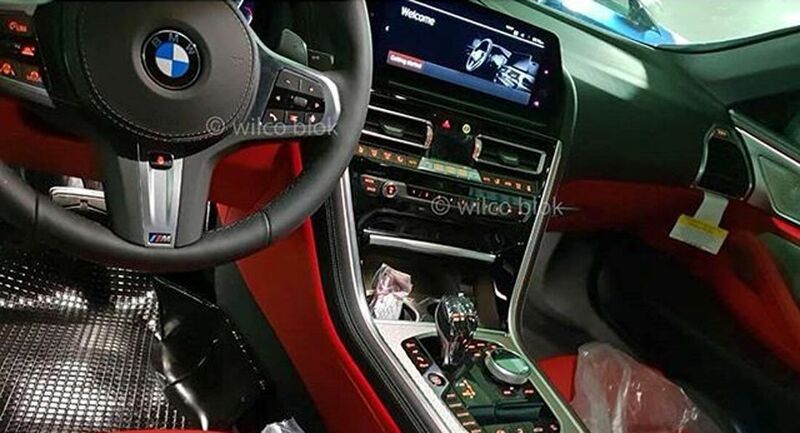 Anyway i see that this 8 series, X5, 3 series gonna have more similar interiors than ever. Probably only Lexus is making various interios in their cars for now. Nice interior, different than current BMW interiors, but nothing special to carry the 8-series’ name. While I agree, maybe were being to hard on this. My friend had a first gen 8-Series and looking back, it’s interior wasn’t especially bespoke either to other BMW’s back then. Now I do believe times have changed but maybe we (including myself) are being to hard on this vehicle? Maybe. 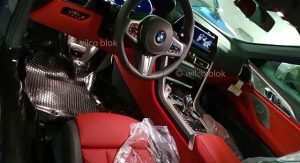 I guess I expected more since this was supposed to be a revolution in BMW’s interior design but I guess I’ll hold final judgment until it’s properly released. I think those middle vents look cheap but once again I’ll reserve final judgement. Looks better than most of the BMW interiors that are out now. Yeah that interior looks a little bland and generic. Doesn’t feel special. Looking at that exterior shot also just looks to me as another 6 series now sporting an 8 series badge on it. It looks massive. 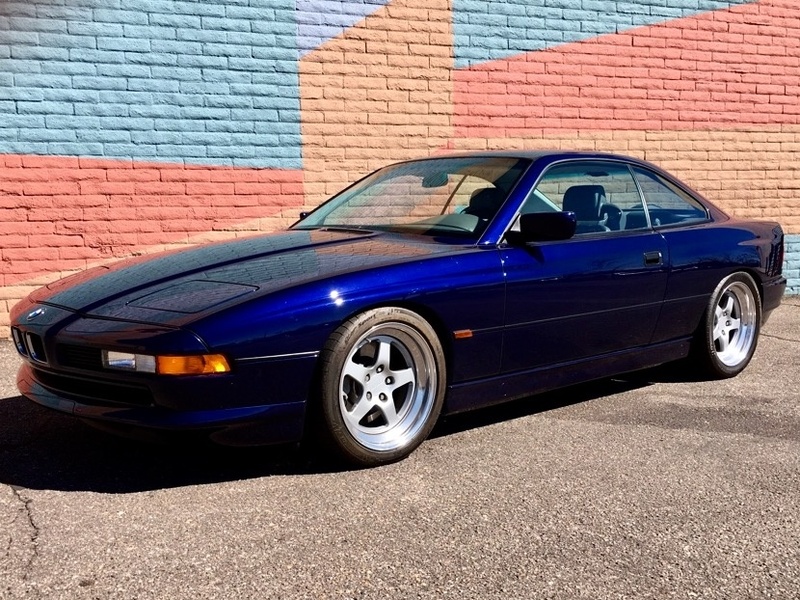 The original 8 series was a wow car at the time, a BMW with pop up headlights and a very svelte looking body. The new one looks bloated to me in that shot. And it has the regular corporate BMW front end look. Yeah I think I will pass. When yuk isn’t a strong enough word. 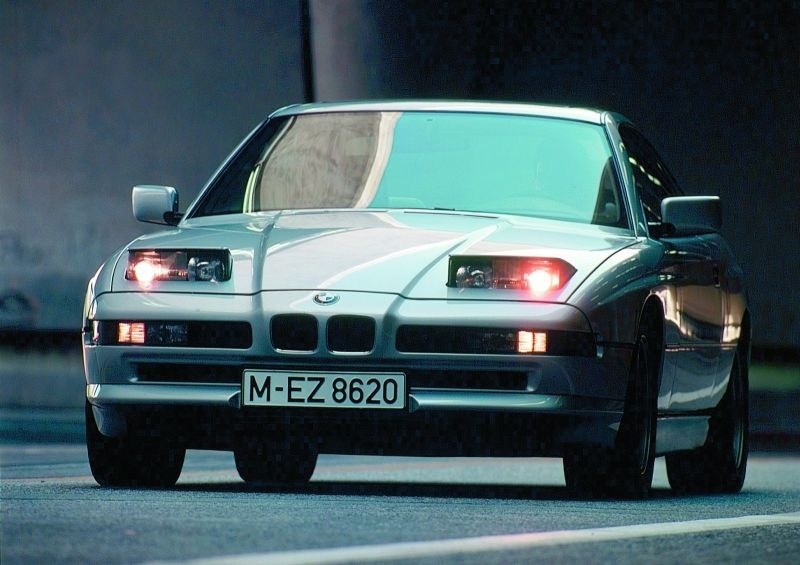 Can’t compare to old bmw 8 series, that interior was special! It does not look special at all. Looks rather nice in these pics. Reserve final judgement for the red and possible gaudy excess of metal accents though. 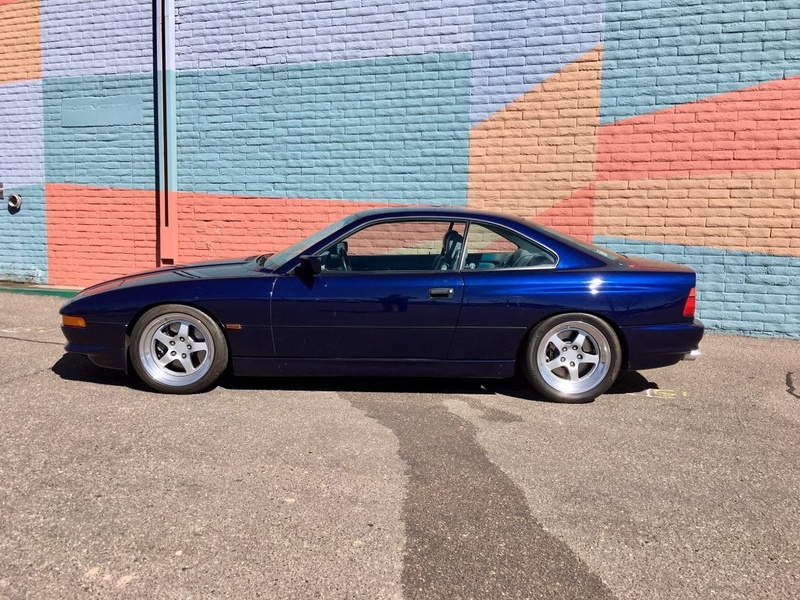 original 8-Series interior (and exterior) still look superior. No comparison. New one looks like a 2006 6-Series. Quality? Yes. Exclusivity? No. Promlematic? Depends. I prefer a more unique interior at the top of their range. 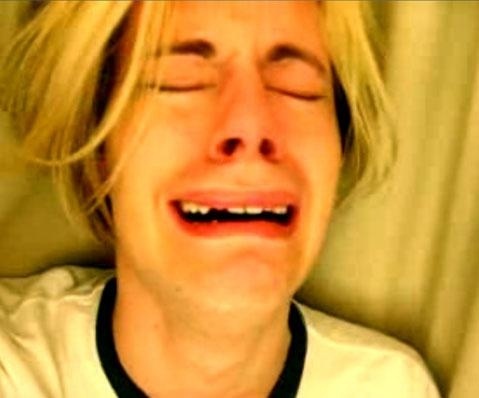 Feels too parts bin. You should be somewhat mesmerized catching a glimpse of the 850’s interior when you own a 540i, not familiarized. Lame outcome approaching the year 2020. We dreamed boldly of this time, yet now we have this.